Naomi may be the most remarkable hero to hit the comic stands in quite some time...but it has nothing to do with powers or abilities. 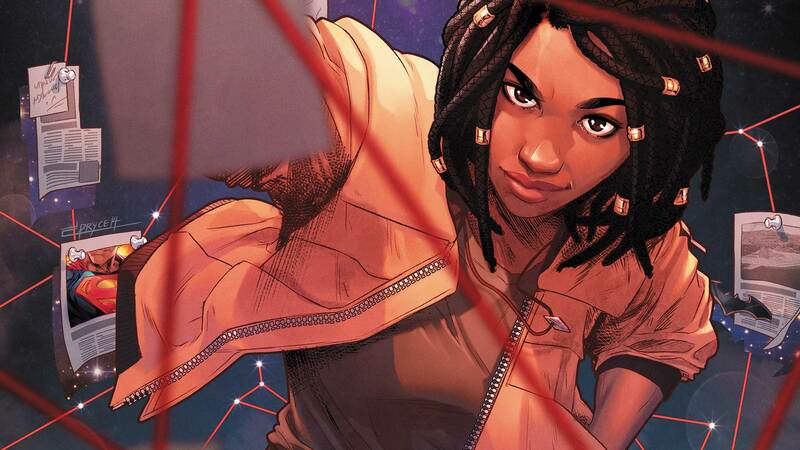 It is long past time for some new superheroes to take center stage, and that couldn't be more apparent than with Wonder Comics' new series NAOMI. From the very first pages of NAOMI #1, it's obvious that this isn't your average superhero comic book. While the first few panels make it clear that the new series from Brian Michael Bendis, David Walker and artist Jamal Campbell takes place within the larger DC Universe, it's the first and sixth pages that really set the tone for the most sincere, inclusive and, yes, feminist comic you didn't know you needed…until now. When a fight between Superman and Mongul crash lands into a small town far from any major city, it's the most action (superhero or otherwise) that the citizens have ever seen. Or is it? One young, adopted teenager, Naomi, is convinced that there's actually another instance of a super-powered person landing in her town in the past, and it might hold some answers into her own origins. This comic book mystery about Naomi's adoption and her obsession with Superman's appearance in her hometown is poised to become one of DC’s most important series yet. But it’s not for the potential game-changing reverberations it will cast throughout the DC Universe (although who knows, maybe it could!). Rather, it’s for moving the focus away from the men and women in costume, and putting a young woman of color front and center as the hero of her own story. Naomi is a young black teen, confidently sporting gold dreadlock cuff beads in her hair, representing a vision of a hero that accurately reflects the real world. It brings some always welcome diversity to a medium that still occasionally struggles with it. Superheroes don't have to be white men with unrealistic muscles bulging through spandex—a young WOC in cargo pants and a mustard yellow bomber jacket can save her own life (and maybe the world one day). Even when Naomi's friends, parents and fellow townspeople don't believe her when she tries to uncover a superheroic event from 17 years in the past, she pushes forward and believes in herself, resulting in a reward greater than she could have imagined. She proves in the first issue alone that anyone can be a hero as long as they believe in themselves, work hard and commit to the truth no matter what obstacles lay ahead. But it's not just Naomi. Every character in this debut issues is allowed to be a real, three-dimensional person instead of a caricature. Her two best friends are a goth girl dressed to the nines in edgy black clothes and a pink-haired bubbly optimist who looks like an Instagram Influencer come to life. These seemingly opposite character tropes could have been cliché had they not been written as best friends who share real love and trust with each other and don't roll their eyes at everything the other says, no matter if they agree or not. And most importantly, each of the three women at the center of Naomi #1 are feminist *and* feminine, because the two are not mutually exclusive. They're all allowed to be as girly as they want, in appearance, attitude and voice, without being presented as unimportant or inconsequential. If anything, their varying levels of femininity only add to how badass they are and how awesome their friendship is. It can't be stressed enough how important it is for young girls and teens and boys and women and men—literally everyone—to see characters like that. It helps young people grow up to be whoever they want to be with confidence. Showing love for your friends isn't embarrassing or lame—it only adds to your strength. Maybe if everyone learned that lesson, the world wouldn't be the scary place it is right now. As if all those reasons weren't enough as to why Naomi is going to be your new favorite series, it also brilliantly takes us inside the world of DC's superheroes from a real perspective for the first time in a while. The world of Superman is merged with ours. We're seeing all of these heroes and villains from the perspective of those nameless and faceless bystanders of Superman's heroics. This crash landing during a fight with Mongul is just one of Superman's countless heroic deeds in that day. It's too small of a blip to even be reported on, and yet it sets the stage for this entire series, bringing a real sense of humanity and reality to something that would hardly even merit a panel in any other Superman book. Naomi also cleverly skewers internet and stan culture, filtered through the lens of superheroes. It's meta, self-referential and hilarious. So, do yourself a favor and dive into the world of DC and Wonder Comics' newest character ASAP, because seriously, there’s nothing else like it on the stands right now. NAOMI #1 by Brian Michael Bendis, David F. Walker and Jamal Campbell is now available in print and as a digital download.